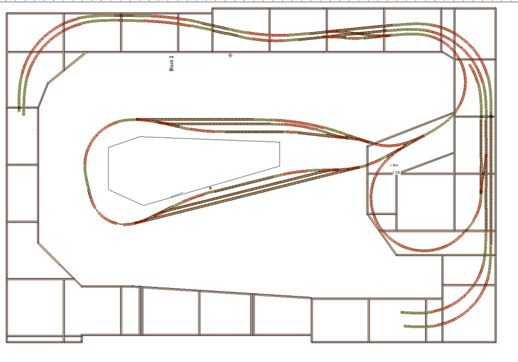 A track plan based on a Cyril Freezer Terminus layout was developed and drawn in track planning software. The plans were printed out full size on A0 sheets and the lines transfered to baseboards using carbon paper. If I were doing it again I think would have just stuck the sheets onto the board and built on top of them. It was certainly a lot of time tracing over lines. Above is the plan of the upper level. The lower level originally just contained a reverse loop, but is now being extended to contain concealed sidings / fiddle yard under the terminus. The picture below of the main terminus was taken at the end of 2004. Progress has been somewhat spasmodic. 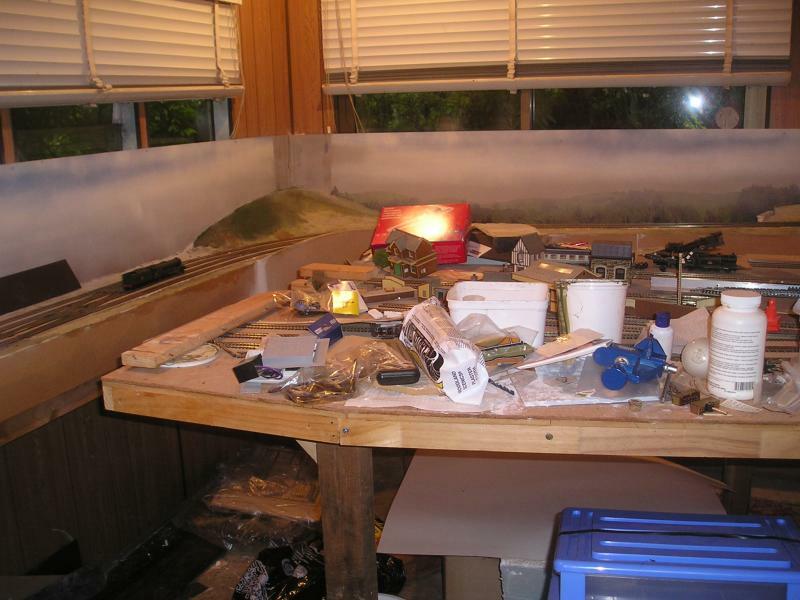 Not too much visible progress by 2005; although the mess has diffused to different locations. Most of the spare time through this period spent on the layout was trying to construct a diode matrix to set routes through the pointwork. It was too problematic trying to do this by eye (especially through the double slips). Unexpected derailments were so frequent that they were actually expected. There was quite a long pause after this time where I worked out how I would control the layout and aquired the necessary bits and pieces and software to make this a reality. 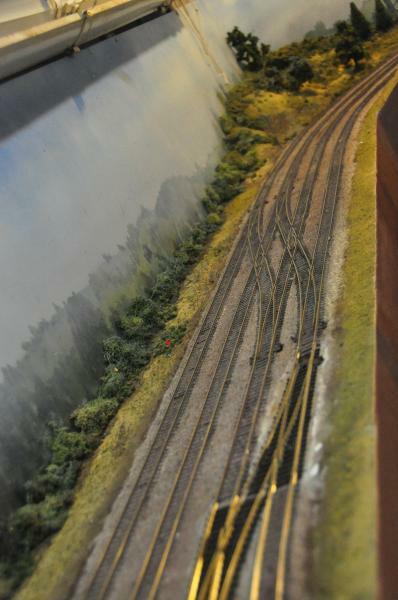 This was always intended to be a layout that focussed on operation rather than modelling fidelity. In short I always wanted to make something that was complex. And this is the terminus switchboard. The connectors A,B,C & D link the two switchboards. From the outset the layout was Digitrax DCC; even when I was blowing up CDU's with my diode matrix route control experiments, so at least I didn't have to splash out on a command station when I plunged into computer control. I opted for current sensing occupancy detectors and a Tower Controller from RR Cirkits, with a mixture of Lenz and Digitrax accessory decoders for point control. Installation of wiring for power, occupancy detection and point control has taken place through the last part of 2012 and will be completed in the next couple of months after I receive my second Tower Controller (I'm now past 64 blocks) and three more DS64's for the hidden fiddle yard points. Testing has shown me that with reliable rolling stock the system and the layout can handle multi train control perfectly. 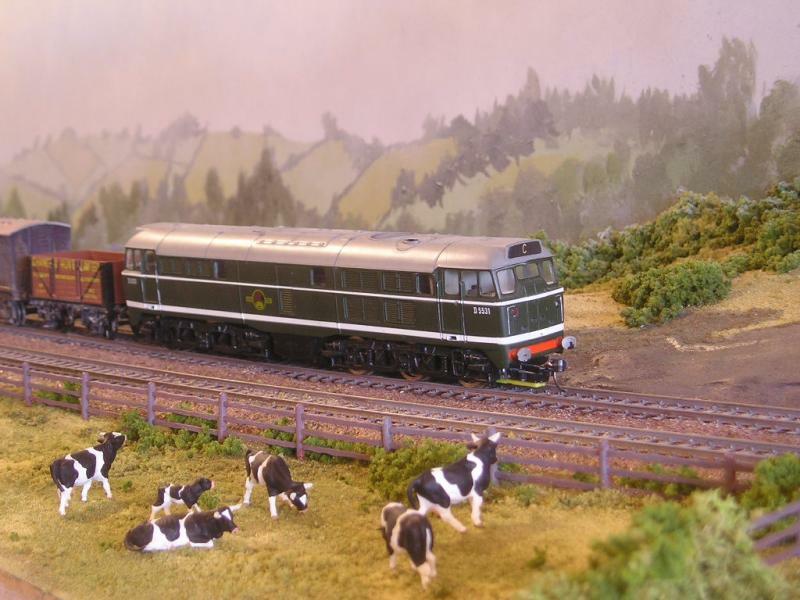 My Bachmann Class 47 glides through the complex pointwork and will stop inch perfect at it's intended destination. 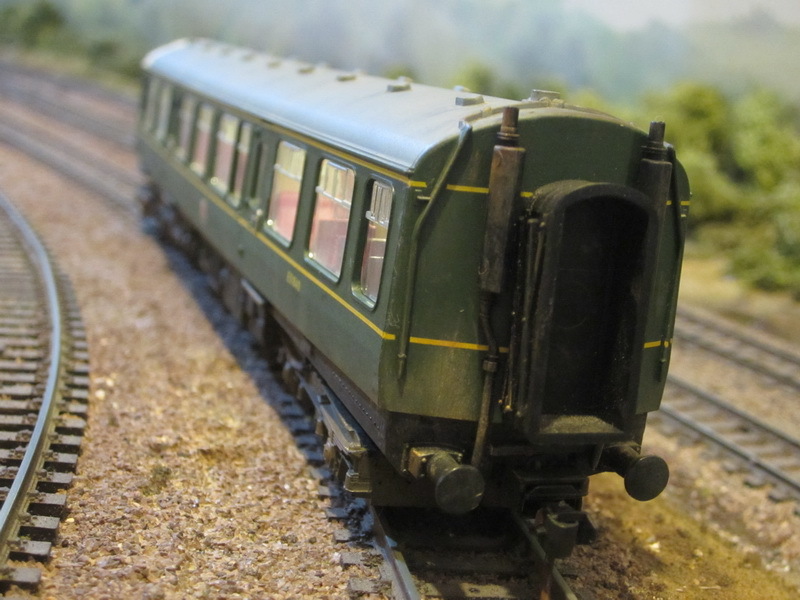 My old Hornby Jinty is another story all together. 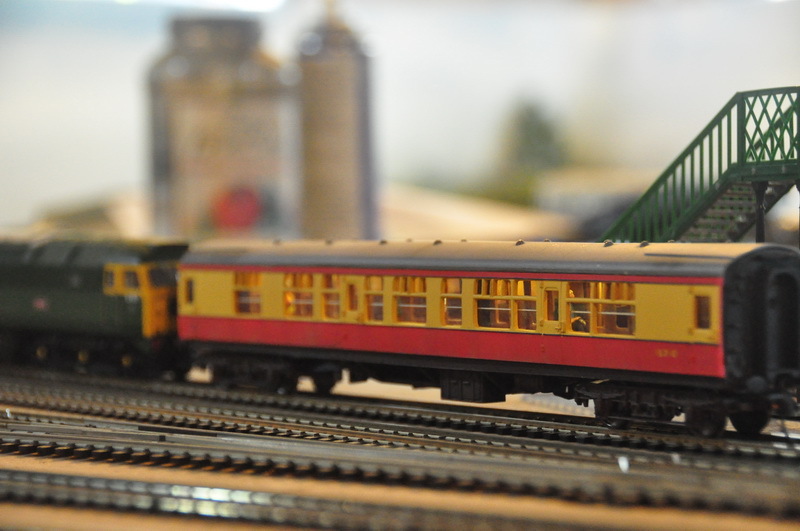 I haven't taken any pictures of progress for some time; but as the wiring is nearly completed I will soon be moving back on to buildings and scenery, In the meantime here is a picture of part of the mainline. More pictures will follow in time. Have you upgraded to V 8? That is some layout you have. DCC is something I'm still learning, but it seems like you have it all worked out ! 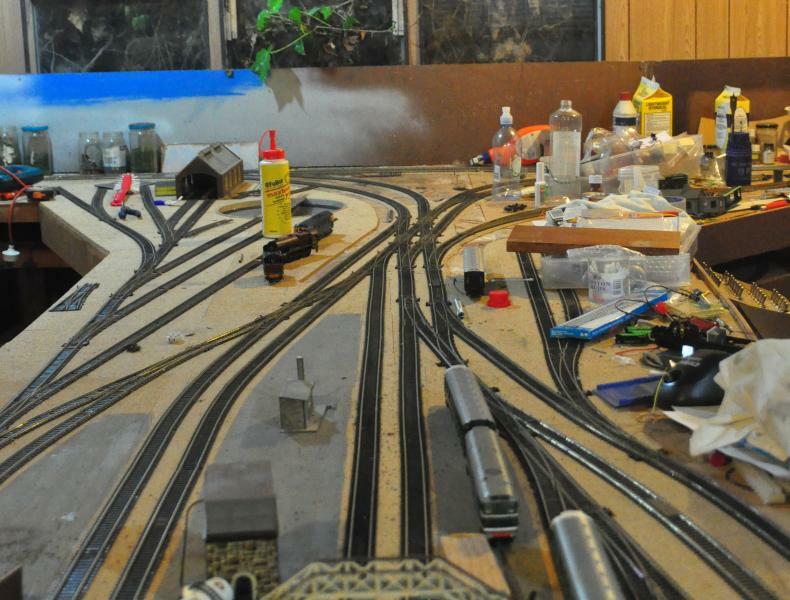 Can't wait to see more pics of the layout. Yes I have upgraded to V8. Still not really got to grips with the subtle improvements. Being a Digitrax user I have to re-profile all my engines to make them behave as intended again. Only 2 done so far. My RR&Co layout has been down for a while, Peter. I've extended it, so I think I'll upgrade when I get back on the air again. I lost all of my Trainanimator pictues, so I'll have to basically start from scratch. I upgraded my TC laptop and somehow lost my Track Plans and Schedules. Still it will be fun starting from scratch - again. 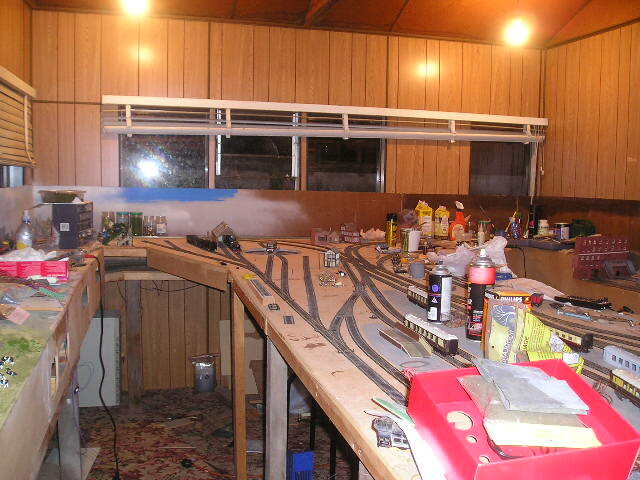 It's encouraging to see another TC user's layout. Mine is nowhere near as ambitious as yours and I am tending to concentrate on signalling. I have a digitrax SE8C signal decoder in the cupboard, but I haven't really decided how I'll use it yet. It was this section of track at the entrance to my station that convinced me I needed the computer to control my points. Surprisingly most things manage to negotiate the large rail gaps you can see between the double slips. I intend to fill the gap with plasticard before ballasting. The picture below shows this junction in the overall context. I can't for the life of me think how I'll signal this bit so I'll probably just have platform starters and place some signals on the main line. I now realise that my layout looks better from the underneath than it does on top. I'll soon have to do something about that! The ivy growing in the window is quite attractive though. This crossover on the mainline probaly lends itself to some proper signalling. This is the point where the figure 8 meets , i.e the double track going down reaches the same level as the double track going up. You can use this crossover to keep a train going on the round and round baon the lower level without it coming up to interfere with the main station entry junction. The back scene painting uses my patent technique. Splash some paint on to represent fields trees and sky and then fade it all out by overspraying with a spray can of grey car body primer. I think the whole thing took less than an hour. The unkind might say that it looks like it took less than an hour. The picture below makes it look very pink, but in reality it is more of a pale blue. You can see the blue I used before "fading" it on the unpainted hardboard panels a couple of pictures above. I didn't want to have anything too defined in the background, but I've now seen how other people are making such good use of digital photographs to create stunning backgrounds that blend with the scene; so I may revisit that. But probably not this year. I am beginning to appreciate the complexity of your layout: It has taken me 15min or so to match the photos and the switchboards and run my finger around the possible routes, counting the blocks as I go. I see what you mean about the signalling. I think the backscenes are very effective. I will find some scrap hardboard and give it a trial. I agree with Brian, back scene looks great, I must have go on my plain white boards. My layout is still somewhat bland so I thought I'd post some pictures of the underneath. Much more colourful. Blue CAT5 cable to the current sensing coils for occupancy detection, red a black DCC power (thick red and black is the main DCC power bus) and blue and white twisted pairs to the point motors. This is the main distribution panel that is fixed verically to a couple of the table support legs. This is the back side of the panel. 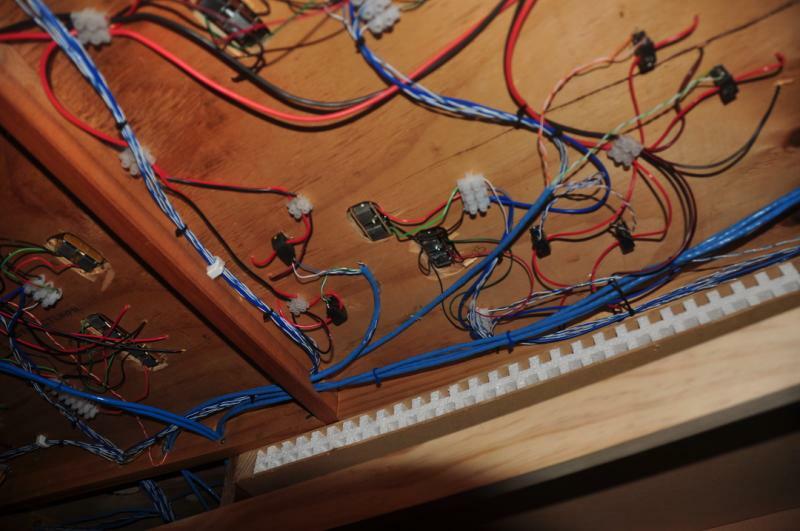 A removable panel with ventilation grilles will hide this wiring when the wiring is complete. 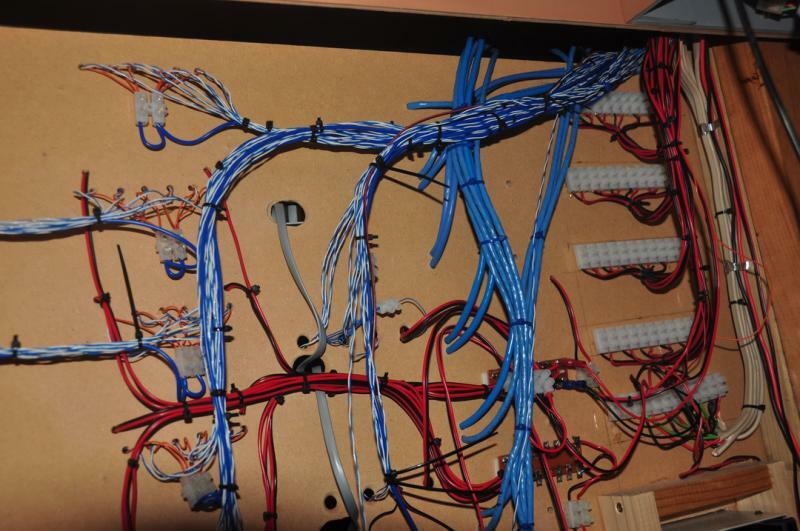 The red and black wiring to the chocolate block connectors on the right hand side is all redundant. 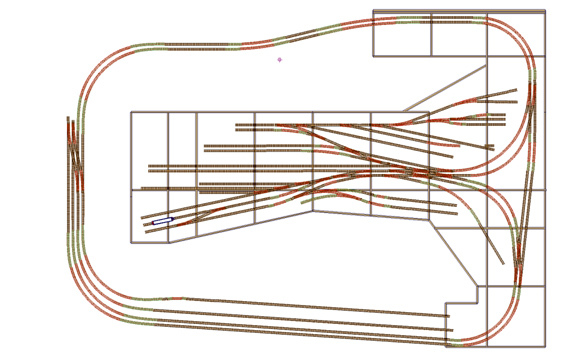 My original idea was to switch power at the consol to 24 separate sections of the layout. I thought this would be great for fault isolation. Turned out to be a very bad idea if you are using current sensing coils. I may use the switches and connection points for layout lighting, if I don't hand lighting over to the computer to control as well. 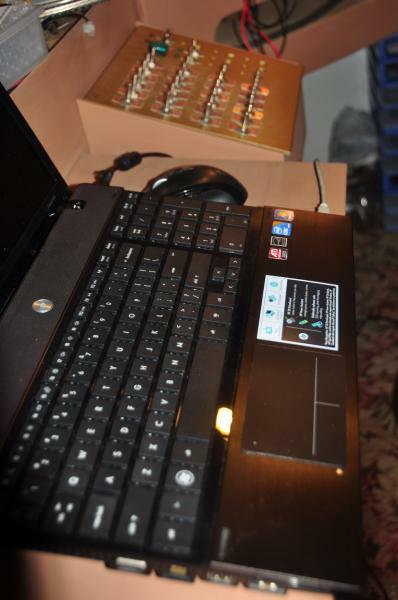 The redundant switches can be seen on the control panel beyond the PC. Only four of the switches actually do anything now. I still have to install a second Tower Controller ( the first one is maxed out) and three more DS64's. 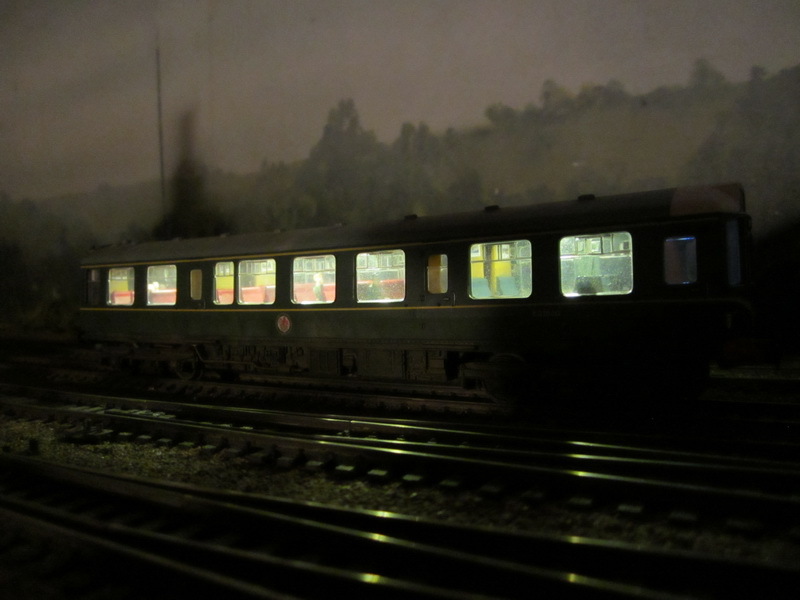 Then I can start thinking about signalling and layout lighting. Wow, but you must be doing something wrong? DCC, it's only two wires! I heard that too Ted. Well I started off with two wires, then I discovered how easy it was with DCC for the express passenger train to thunder head on into the milk train so I added a few more wires and then I just got kinda carried away. Work has been progressing on Bidley over the last few weeks. 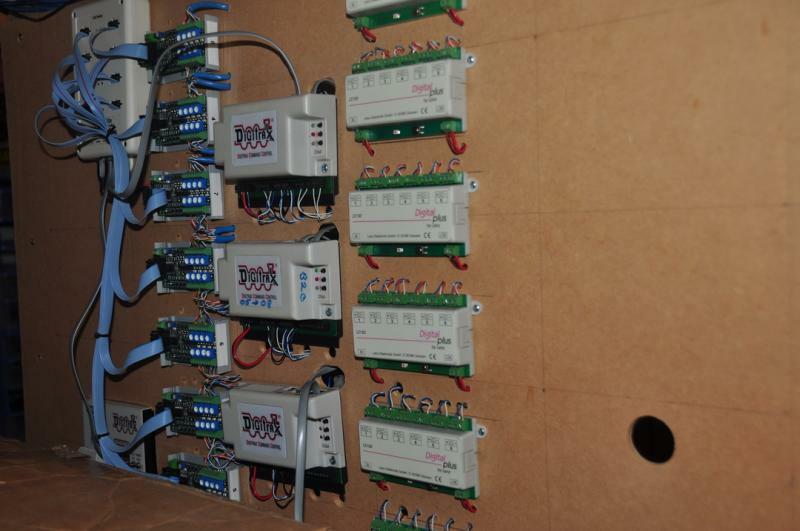 The lower level, hidden sidings have all been installed, complete with occupancy detection and DS64 accessory decoders for the points. Nearly done as the layout I posted above. I snuck in a couple of additional sidings to take longer trains. They have to reverse out, but I felt it was worth it to able to "hide" 6 coach trains. The last week or so I have been distracted with playing with coach lighting. 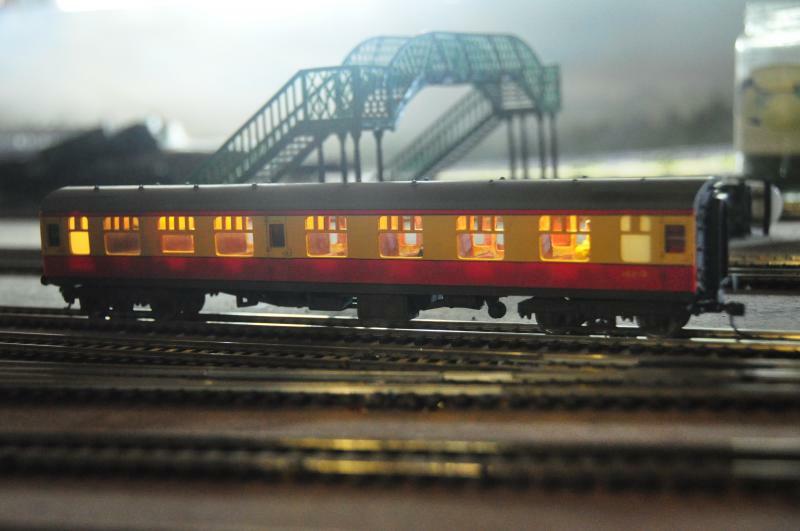 I bought 6 1970's hornby coaches of the internet a while back and thought I would use them to practice weathering, lighting etc before attempting it anything more valuable. I discovered that white LED's on a roll of tape were very affordable. NZ$1.90 per 3 LED module. You cut them off the roll, either in a group of 3, which can then be wired direct to 12V DC (the required resistors are pre-wired into the tape, or individually, when you then need to add your own resistor. This is the first attempt. I started with a 10K resistor. This looked very realistic in the dark, but in normal room lighting conditions you couldn't tell there were any lights installed. As I wanted to see the benefit of my labour, I reduced the resistor to 1K. The LED's are now too bright. This is especially noticeable in photographs, where you can see red glowing carriage sides and the silhouette of the seats. It doesn't really show to the eye so I will leave this coach as it is and increase the resistor to reduce the brightness on the next one. I have been distracted from work on the layout proper by further attempts to make my stock look less toy like. 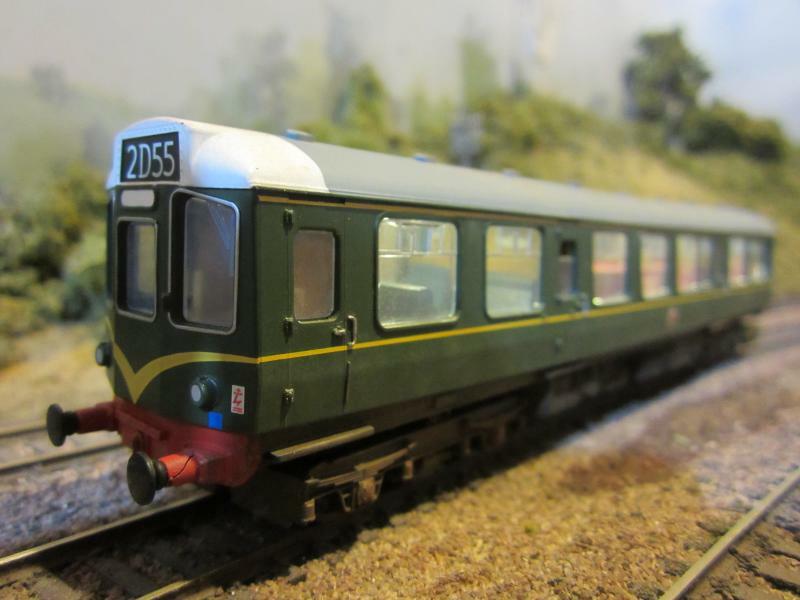 Next off the block is a 110 DMU. I have two of these that will run a shuttle service between Bidley and Lower Bidley. Lighting has been installed using the same technique I used in my previous post. The cream plastic molded interior has been painted, with my guess on an interior colour scheme. 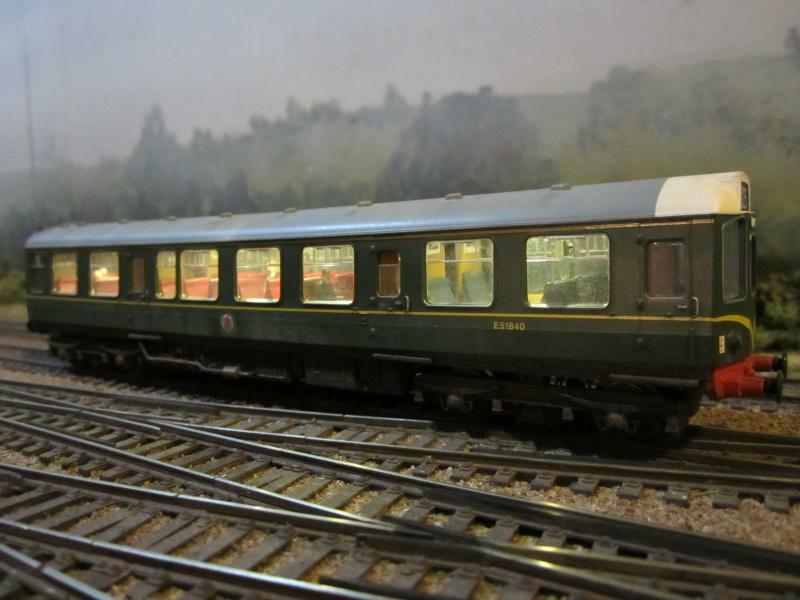 If anyone has any colour pictures of the interior of a 110 DMU please point me to them. I've added a few passengers to the interior. 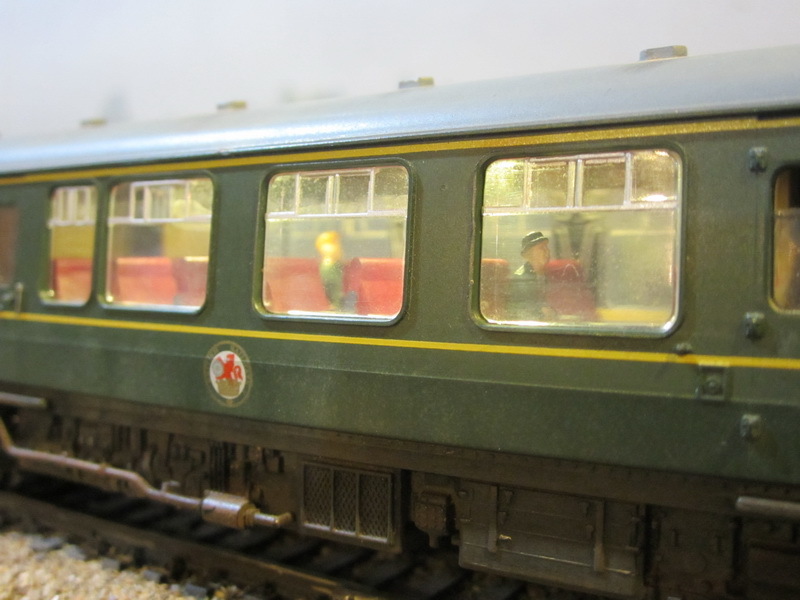 These were Bachmann HO seated passengers, although I had to overpaint some of the clothing colours. Why would they think we would want a man in a bright blue suit with a silver hat??? He is now soberly dressed in grey. The exterior was given a bit of weathering to make it look less plasticky. This time I don't get the glowing plastic effect I had in my previoous attempt at lighting. I put some BR advertising pictures on the walls. You can see them if you look carefully, but at that size you can't really make out what they are. 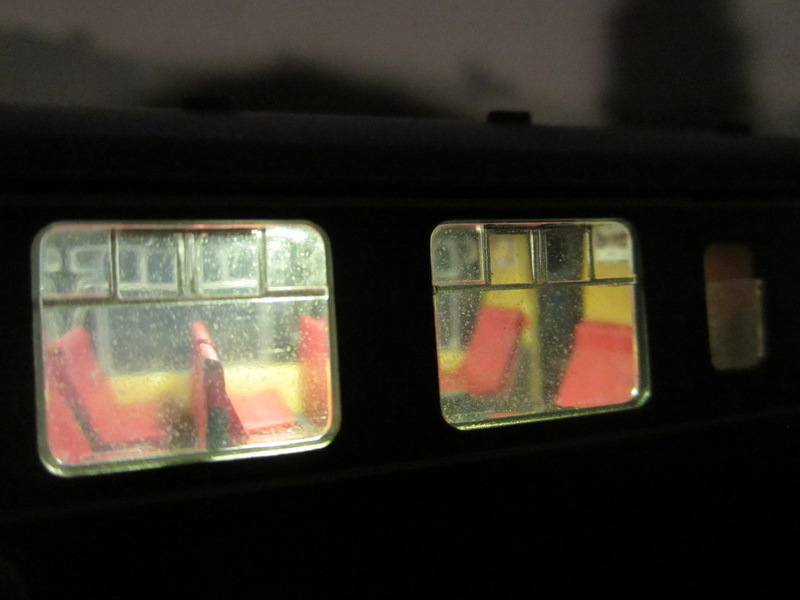 Belive it or not, I masked the windows before doing the weathering. I must find a way of giving them a clean up. Well one done, 5 more to go. Hopefully it should get quicker. I must also fix that cracked buffer. I hadn't even noticed it before I saw it on the photo. When function only decoders drop in price I will put a decoder in the toilet compartment (thats where the resistor and diode are currently hidden) thenm I will be able to turn the lights on and off and install some directional front/rear lights. At the moment it's just too expensive. Believe it or not the window cleaners have been. The camera can be very cruel. I think it looks passable from a normal viewing distance and less like a plastic toy. Or is this just wishful thinking? Just come across this thread and love the layout. I would have loved to have built this plan but just don't have enough space. More pics of the layout please ! I was taking a look at your wiring and I am in awe! Thanks also for your advice on that lenz return loop module. Hi Peter, it's a big project you've taken on there. Little distractions such as improving your stock can be very satisfying. 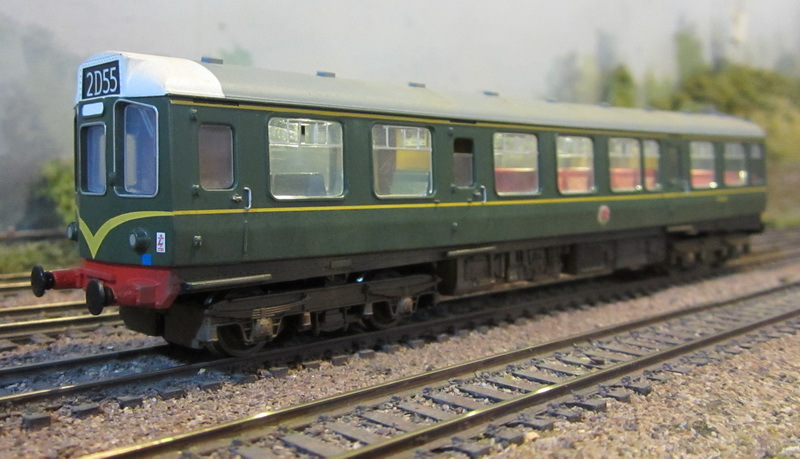 I think you've done a good job on the 110, not that I know much about diesels but at least it is the right colour. I think your 110 looks really good. 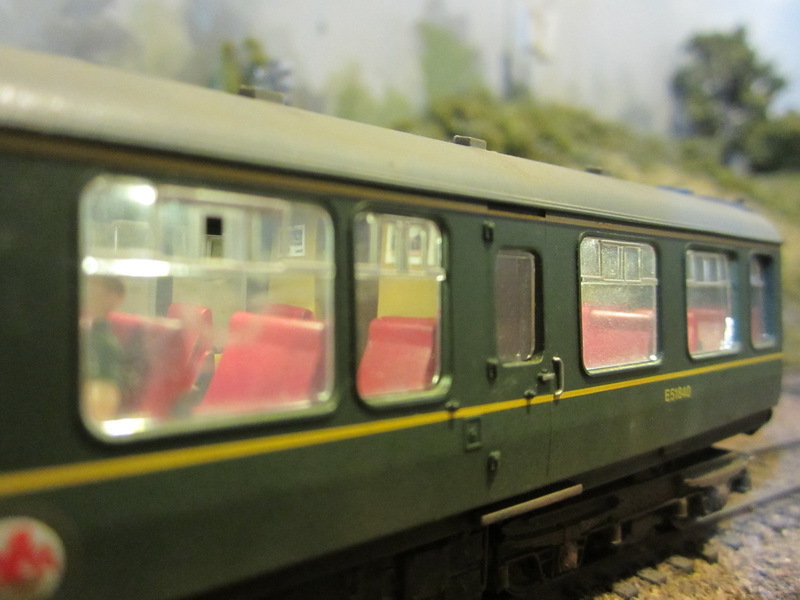 Seem to remember when I traveled on Southern Region EMUs in the '60s the windows quite often looked more like the ones in your photo before you cleaned them.